هدف از این مطالعه بررسی اقتصادی مصرف نهاده‌های مختلف در تولید زعفران و نیز اندازه‌گیری کارایی تولید این محصول در مزارع کوچک و بزرگ استان خراسان رضوی می‌باشد. آمار و اطلاعات مورد نیاز از طریق تکمیل پرسشنامه از 170 زعفران‌کار شهرستان‌های تربت حیدریه و زاوه در سال 1393 جمع آوری شده است. به منظور اطمینان از صحت انتخاب الگوی تولید مورد استفاده سه فرم تابعی کاب داگلاس، ترانسندنتال و ترانسلوگ مورد آزمون قرار گرفته است. نتایج این پژوهش نشان می‌دهد که فرم تابعی ترانسلوگ مناسب‌ترین فرم برای بیان تکنولوژی تولید این محصول می‌باشد. کشش های تولیدی محاسبه شده بر پایه پارامترهای این تابع بیانگر آن است که بزرگ مالکان در استفاده از نهاده‌ها عملکرد بهتری از خود نشان می‌دهند. افزون بر این مقایسه کارایی دو گروه حاکی از آن است که 49 درصد از مزارع کوچک و 18 درصد از مزارع بزرگ تولید این محصول در سطح ناکارای تولید فعالیت می‌کنند. اختلاف زیاد کمترین و بیشترین کارایی فنی در بین زعفران‌کاران بزرگ مالک نشان می‌دهد امکان افزایش کارایی فنی در این گروه از مزارع نیز از طریق استفاده از شیوه‌های مدیریتی مناسب وجود دارد. The aim of this study is to perform an economic investigation of the use of various inputs in saffron production and to measure the efficiency of its production in small and large farms of the Khorasan Razavi province. The required data was collected from 170 questionnaires completed by saffron producers in the Torbat-e Heydarieh and Zaveh counties in the year 2014. In order to ensure the accuracy of selected production function, the performance of Cobb Douglas, Transcendental and Translog functional forms were tested. The results suggest that Translog functional form is the most appropriate form for expression of production technology of this product. The estimated elasticities based on this production function show that large land owners perform better in the input usage. Moreover, the comparison of technical efficiency between the two groups of farms indicates that 49 percent of small farms and 18 percent of large farms work at inefficient levels of production. The large difference between the lowest and highest technical efficiency in large farms group shows that there is an option to increase technical efficiency in these fields through the use of good management practices. Aigner, D.J., Lovell C.A.K., Schmidt P. 1977. Formulation and Estimation of Stochastic frontier Production Function Models, Journal of Econometrics 6: 21-37. Aghaei, M., Rezagholizadeh, M. 2011. The comparative advantage in the production of saffron, Journal of Agricultural Economics and Development 25 (1): 121-132. (In Persian). Agricultural Jihad of Khorasan Razavi. 2014. Available at website: http://koaj.ir/Modules/showfarmework. (Verified: March, 2015). Amiri Aghdaie, S.F., Roshan, J. 2015. Investigating Effective Factors on Iran’s Saffron Exportation, International Review of Management and Business Research 4 (2): 590-600. Battese, G., Coelli, T. 1992. Frontier Production Functions, Technical Efficiency and Panel Data: With Application to Paddy Farmers in India, Journal of Productivity Analysis 3 (1): 153–169. Biria, S., Jabal Ameli, F. 2006. Factors affecting export of pistachio, saffron, date in the basket of goods exports (1991-2001), Journal of Agricultural Economics and Development 14 (54): 85-101. (In Persian). Borimnejad, V., Mohtashami, T., 2009. Technical efficiency of wheat production in Iran: A case study, Journal of Agricultural Economics Research 1 (1): 75-93. (In Persian). Chambers, R.G., 1988. Applied Production Analysis: A Dual Approach. Cambridge University, Press, UK. Christensen, L.R., Jorgenson, D.W., Lau, L.J. 1971. Conjugate and the Transcendental Logarithmic Function, Econometrica 39: 68-259. Debertin, D. L. 1986. Agricultural Production Economics. Macmillan Publication Company, New York. Farrel, M.T. 1957. The Measurement of Production Efficiency, Journal of the Royal Statistical Society 120: 253-281. Golkaran Moghadam, S. 2013. Compare and analyze the efficiency of saffron in the province of Khorasan Razavi, Journal of Agricultural Economics and Development 21 (82): 79-101. (In Persian). Gujarati, D.N. 2004. Basic Econometrics, Translator Abrishami, H., Tehran University Publications, Iran. Hamzei, M., Bouzarjmehry, KH. 2015. Analysis of Effects and Factors Influencing on Increasing the Cropping Pattern of Saffron in the City of Nishapur Case study: Ishaq Abad district, Saffron Agronomy & Technology 2 (4): 277-288. (In Persian with English Summary). Hatami Sardashti, Z., Bakhshi, M.R., Jami Al- Ahmadi, M. 2014. 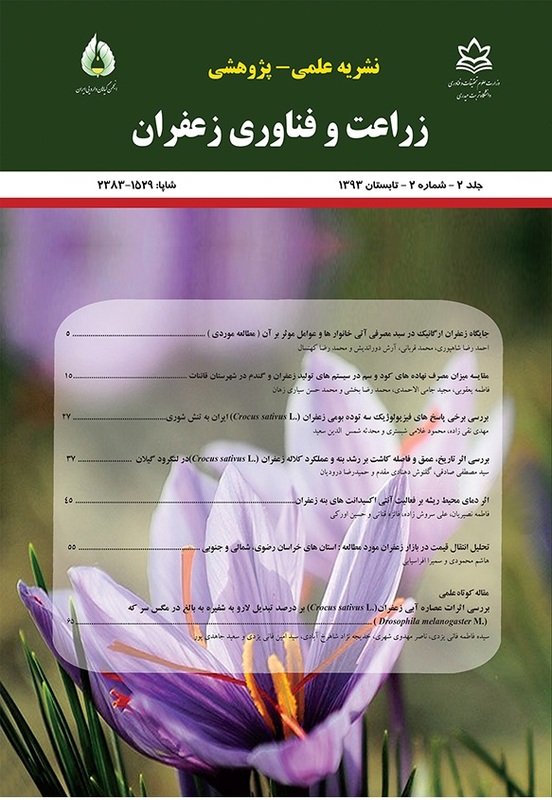 An economic analysis of saffron production in South Khorasan Province, Journal of ecological agriculture 4 (1): 33-42. (In Persian with English Summary). Hosseinzad, J., Salami, H. 2004. Production function to estimate the economic value of agricultural water (A Case Study of Wheat), Journal of Economics and Development 12 (48): 53-84. (In Persian). Karbasi, A.R., Rastegaripour, F. 2014. Evaluation of comparative advantage on production and export of saffron, Saffron Agronomy & Technology 2 (1): 59-74. (In Persian with English Summary). Karbasi, A.R., Mahmodi, H., Fakari Sardehae, B., Farsi Aliabadi, M.M. 2014. Examination of integration and central market hypothesis for saffron market in khorasan razavi, northern khorasan and southern khorasan, Saffron Agronomy & Technology 2 (3): 215-223. (In Persian with English Summary). Karami, H.R. 2015. Saffron cultivation effects on farmers' income and employment in the Lorestan province, Journal of Rural and Development 18 (1): 21-43. (In Persian). Kavoosi Kalashmi, M. 2015. Determination and ranking export goal markets of Iran's packaged Saffron, Saffron Agronomy & Technology 3 (1): 43-48. (In Persian with English Summary). Kavand, H., Kalbali, E., Sabuhi, M. 2014. Application of data envelopment analysis to evaluate the efficiency of saffron growers (Case study: Qaen county), Saffron Agronomy & Technology 2 (1): 17-30. (In Persian with English Summary). Kheirandish, M., Srinivasa Gowda, M.V. 2012. Marketing Efficiency and Price Spread for Safrron in Iran, Trends in Agricultural Economics 5 (1): 23-30. Khodabandeh, N. 2005. Grain, Eighth Edition, Tehran University Publications. Kohansal, M.R., Tohidi, A. 2015. Experimental study of the impact of foreign exchange rate fluctuations on Iran's Saffron export dmand: A dynamic pooled mean group (PMG) approach, Saffron Agronomy & Technology 3 (1): 34-42. (In Persian with English Summary). Mahmoudi, H., Afrasiabi, S. 2014. Analysis the price transmission on saffron market case study: Razavi, North and South Khorasan Provinces, Saffron Agronomy & Technology 2 (3): 155-164. (In Persian with English Summary). Meenusen, W., Van den Broeck, j. 1977. Efficiency Estimation from Cobb-Douglas Production Function with Composed Error. International Economic Review, 18 (2). Ministry of Agriculture Jihad (Iran). 2013. The MAJ Database. Available at Website: http://www.maj.ir. Moghaddasi, R., Alishahi, M. 2007. Study on the Determinants of Iran's Share in World Agricultural Markets, Journal of Agricultural Sciences 13 (1): 21-37. (In Persian with English Summary). Mosavi, S.N., Yazdani, S., Rezaei, M.R. 2009. The effects of globalization on agricultural exports: the Case of saffron, Journal of Agricultural Economics 1 (2): 43-60. (In Persian). Mosavi, S.N., Mhammadi, H. 2010. The effects of the financial crisis the global economy on the export of pistachios and saffron, Journal of Agricultural Economics and Development 19 (75): 135-161. (In Persian). Paseban, F. 2006. Factors affecting export of Iranian saffron, Journal of Economic Studies 6 (2): 1-15. (In Persian). PASS 2011. PASS Version 11. 0.8. Rezapour, S., Mortazavi, S.A. 2010. Effects of globalization on supply and demand in export saffron, Agricultural Economices 4 (3): 153-169. (In Persian). Saboorbilandi, M., Vadiei, A. 2007. Economic Analysis saffron and its impact on farmers' income, 6nd Conference of Agricultural Economics, Mashhad, Iran, 30-31 October. (In Persian). Sadeghi, S.K., Khodaverdizadeh, S., Khodaverdizadeh, M. 2011. Determining comparative advantage export market structure of global import and export of saffron, Agricultural Economices Research 3 (3): 59-76. (In Persian). Shaban, M., Mahmoodi, A. Shawkat Fadai, M. 2014. A survey on technical efficiency, marketing and market structure of saffron crop Iran, Saffron Agronomy & Technology 1 (2): 85-101. (In Persian with English Summary). Torkamani, J. 2000. Analysis of economic, technical efficiency and marketing of Iranian saffron, Science and Technology of Agriculture and Natural Resources 4 (3): 29-44. (In Persian).